Despite the general decline in sales of printed travel guides, WTSS continues to prosper, partly because its proprietor/editors, Chris Gill and Dave Watts, embraced digital media from the start. WTSS content has been licensed to other publishers’ websites since 1995, and the guide has had its own site since 1997 at www.wheretoskiandsnowboard.com. Last year the site was rebuilt using the CMS ExpressionEngine, and now the team is working on ebooks and smartphone apps. 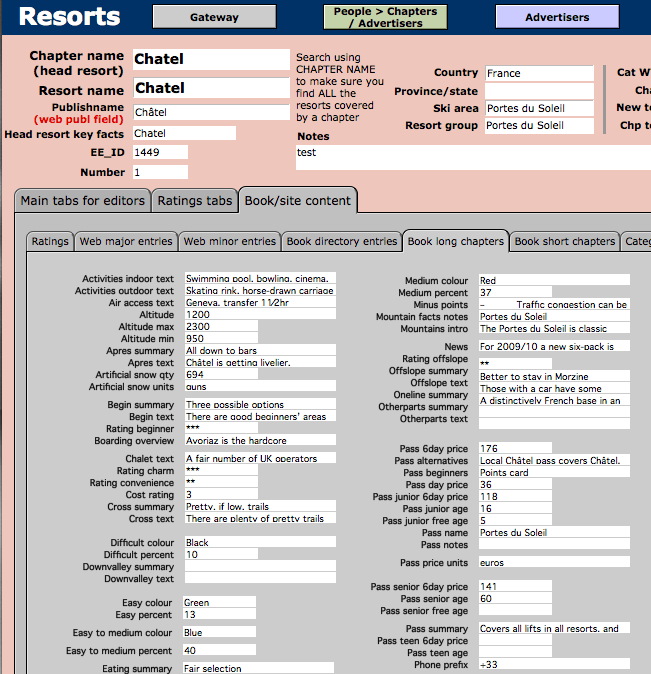 Every year, in the period April to July, every page of the book goes through an extensive process of review and editing in Adobe InDesign to incorporate input from ski companies, tourist offices, those hundreds of readers, and, of course, the editorial team. At the end of this process, pdfs are despatched to the printers (currently a firm in Italy), and two or three weeks later the book is in the UK warehouse awaiting distribution. As soon as the pdfs are approved, one of the team goes back in to each InDesign document—one document per chapter, typically two to ten pages in length—, checks that the InCatalog links embedded in the text have not been messed up in the editing process, and clicks a[n InCatalog extract] button to update the FileMaker database. This way, the thousands of changes made in the previous three months’ work are captured in a structured form. This process takes no more than a couple of days, and once it is completed the whole content of the book is available for selective use in digital media. The team’s current priority is to streamline the process of moving the fresh data in FileMaker across to the MySQL database that underlies the ExpressionEngine website. They already have FileMaker reading and writing to the MySQL database, and only a hassle over encoding of European accented characters remains to be sorted out. Then the whole book-to-site updating process will be about as slick as it gets. Some sample chapters are available at The BookThe Book, http://www.wheretoskiandsnowboard.com/the-book/.